Xclaim™ combines dimensions and simplicity. 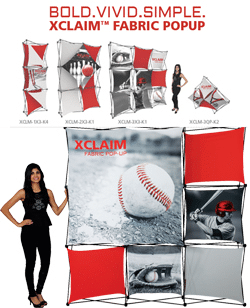 Xclaim couples a collapsible frame and magnetic locking arms with pre-attached, brilliant push-fit fabric graphics. Pop up your frame, connect the magnetic locking arms and you have an instant display. It doesn’t get much easier than this! Xclaim comes in over 29 different styles. With table top, banner size options, to full 10’W x 8’H tradeshow backwall sizes, you are sure to find an Xclaim display that works well for your next event. To learn more, contact your Meridian Sales Rep today! For additional Xclaim styles, click here.